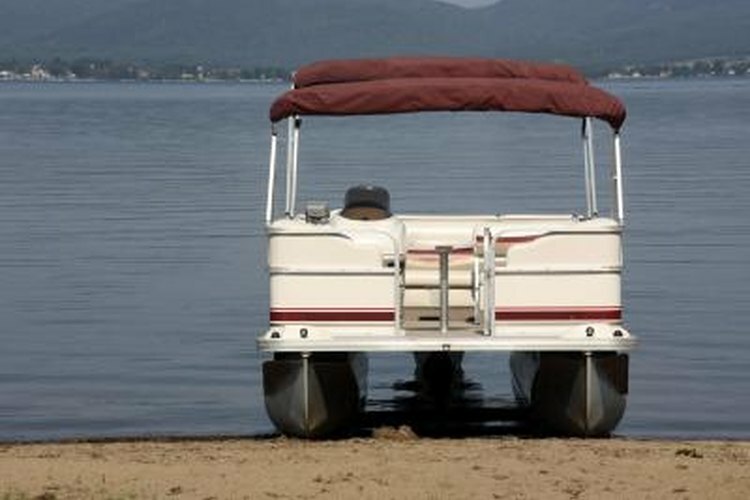 Pontoon boats usually have two or three separate pontoons, which keep them afloat. For a social day on the water, nothing beats cruising around with friends and family aboard a pontoon boat. While pontoon boats behave differently than V-hulled boats in some ways, such as their increased susceptibility to the wind, the basic control systems and piloting principles of the vessels are largely similar. Even nautical novices can learn to pilot a pontoon boat after learning the basics and proceeding with safety in mind. If you are new to boating, investigate and comply with all local boating laws before anointing yourself captain. Additionally, familiarize yourself with the most common nautical terms, such as the sides of the vessel – starboard is right, port is left, bow is front and stern is back. Once aboard the boat, ensure that all safety and communications equipment is present and in working order. The vessel must have a fire extinguisher. Every passenger must have a life jacket, and you should have a cushion that can be thrown to someone in distress. Test the radio to be sure it is working, and bring your cell phone along for additional protection. Verify that the horn works and that the vessel has sufficient fuel for your journey. While they appear somewhat alien at first glance, the basic components and controls are rather simple: A throttle lever adjusts the speed and direction of the propeller, or “prop”, while a steering wheel rotates the motor left and right. A trim control adjusts the height of the prop, while the lights, radio and horn work intuitively. Gauges or displays near the steering wheel indicate the engine speed and fuel level. Secure all equipment and ensure that the weight is distributed evenly on the boat. Start the motor and allow it to idle per the manufacturer’s instructions. Trim the motor so that the motor is in the water, but not contacting the bottom. Have a crew member untie the deck ropes and help guide the boat while you gently place the throttle in reverse. Back away from the dock slowly by engaging the throttle using short, controlled bursts, until you are clear of all obstructions and boats. Turn the steering wheel to rotate the boat so that the bow points in the direction you intend to travel -- preferably into the wind. Slowly transition the throttle to the forward position and head toward your destination. Increase your speed smoothly until cruising along at a reasonable and safe pace. When maneuvering the vessel, plan your turns in advance so you can make gentle, sweeping course changes, rather than sudden sharp turns. Be sure to look behind you to ensure no other craft is close before making any turns. Piloting a pontoon boat is much different than driving a car, particularly when you are traveling at high speeds. Whereas a car steers from the front, a pontoon boat steers from the back, which makes it easy to "push" the stern of the boat out to the side. Piloting a pontoon boat smoothly into a designated slip – akin to a parking space – is often the most challenging skill to learn. In addition to steering the craft into a tight space with relatively little room for error, you must learn to account for winds and water currents, which can undermine your efforts. It may be helpful to have a crew member jump onto the dock with dock ropes in hand, and help drag the boat into place. What Is the Advantage of a Dual-Prop Boat?